"The Secret of Meteor Island,"
as Warner Bros.Online and DC Comics Online present "The Superman Radio Serial." 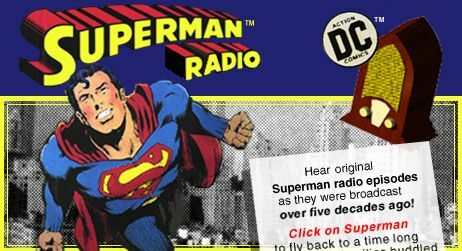 Presented in streaming RealAudio 2.0, this exciting site rebroadcasts original Superman radio programs using the latest online technology. Complete with the original public service announcements telling of traditional America values, each 15-minute chapter provides an experience that combines the excitement of the classic superhero with the warmth and comfort of wholesome family entertainment. If you already have RealAudio 2.0 installed, simply click on Superman to fly back in time to the golden age of radio. If you need to download and install RealAudio 2.0, you can find the 2.0 player at the RealAudio Web Site.To use RealAudio 2.0 you should have a 28.8 BPS modem and either a Pentium or PowerMac computer. If you aren't sure if your computer or modem speed supports RealAudio 2.0 or if you are just feel like you need some help, we offer a RealAudio help page. This site also offers a RealAudio 1.0 option for computers that don't support RealAudio 2.0. Finally, the battle for truth, justice, and the American way has come to the Internet...and it comes to you from Warner Bros .Online and DC Comics Online.